Small packet, or an 'S'-sized parcel? Parcel shippers need to be able to find out the correct size category of parcels with a high degree of reliability. 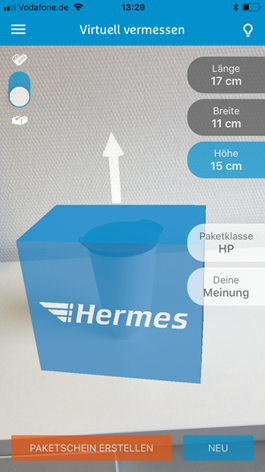 The Hermes app now simplifies calculations – thanks to augmented reality (AR). How does this technology work? What new features are in the pipeline? 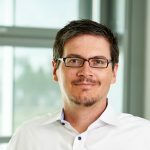 An interview with Alexander Lange, Head of Digital Portal Management, and IT consultant Felix Margraf will shed some light on these growing technologies. Felix, your developer team has expanded the Hermes iOS app to include an augmented reality parcel size calculator. What is this exactly? Felix Margraf: The new parcel size calculator is an easy-to-use, convenient way for customers to determine the right size category of their parcels simply using the camera on their cell phone. This cuts out the need for a tape measure to physically measure the size of the parcel. Such a feature was a real challenge for the developers simply because the technology is still fresh – which is probably why it was pretty exciting too. How does this technology work exactly? 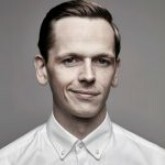 Felix Margraf: The technology is based on augmented reality, a computer-supported extension of our field of vision, or reality. For this we used an AR kit Apple developed and released last fall with iOS 11. This AR kit enables an iPhone to recognize areas in a live image, to place objects in this field and to measure dimensions and distance. The calculation is a result of combing the camera image with other data that comes from the phone's movement sensors. The software then does the rest. Felix Margraf: This is a more convenient way of producing a parcel label without the hassle of measuring the parcel with a tape measure. If you want to send your parcel with Hermes, you can now measure it using your cell phone and then produce a label with the same app. Actually, it couldn't be any easier! People have been able to produce a label with the Hermes app on their cell phone since 2014 . Do many customers actually do this? Alexander Lange: Sure, and encouragingly numbers are growing! Hundreds of thousands of our private shipments are being processed using the Hermes app. Our customers love this speedy, convenient and paper-less way of producing a parcel label. Small commercial powersellers with a few hundred shipments a year can expect to save several hours a month using the app. You can't yet pay for the parcel label using the app. Is online payment not an option? Alexander Lange: It is, but currently, because we are rebuilding the myHermes.de customer platform, we have other priorities. This rebuild means that we are laying the technological and organisational foundations for future growth. The next step would then be to set up an online payment procedure, both on the website and in the app. OK, so you're placing augmented reality ahead of online payment. Hand on heart though, isn't AR just a technical gimmick? Alexander Lange: Not at all. AR technology is pretty mature and the virtual dimensions – as measured in our parcel size calculator, for example – are extremely close to real values. The sticking point is user experience: we have to make it as simple as possible for users to pack the things they want to ship correctly so that they can figure out not only the parcel category but also the shipping costs. If this is not quicker and more convenient that using a ruler or tape measure, we still have a lot of work ahead of us. And? Do you still have work ahead of you? Alexander Lange: Yes, all the time. But that is just normal. The feature is brand new and still in the beta stage. We are constantly learning and gathering quite extensive user feedback. For us, this is extremely important. Currently only iPhone owners can use the new function. What about Android? Felix Margraf: With its ARCore for Android, Google recently came up with a solution that works in much the same way as Apple's ARKit. However, the technology is not widespread enough. At the moment, ARCore is only available for Google Pixel and Samsung's Galaxy S8 and S8 Plus. Nevertheless, we are working on it: at the end of the day, Android is an important platform for us. Smart speakers are becoming increasingly important for many corporations. In the UK, Hermes is already actively using Amazon Echo and Google Home. When will Germany follow? Alexander Lange: Only when it is really relevant for key groups of clients and when the technology has been well-engineered. At Hermes Germany, we have already developed appropriate applications and carried out tests. But the value added of Alexa & Co. is still pretty much restricted for us at the moment. Things are different in the UK: smart speakers are much more widespread and the fact that everything is in English means that voice controls are more advanced. However, Germany is catching up pretty quickly. We are watching developments closely. What feature are you looking to develop next for the app? Felix Margraf: One of the things we are currently working on is an improved integration of preferred delivery options. Having optimized diverse processes, the service will soon be easier to use for even more customers. We are now inching towards our biggest goal of being able to offer as many customers as possible the maximum possible control of parcel shipments. And the live tracking of delivery vehicles using the app is once again a matter of public discussion. 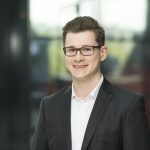 Alexander Lange: Sure, it's a great feature, but as far as the recipient is concerned, there are more important things such as the reliable notification of delivery and a calculatable and short time frame for delivery that a courier can actually meet. I am sure customers would ultimately have more benefit from this than with a virtual vehicle winding its way through the neighbourhood on Google Maps. The best tracking system for parcels is actually one that you no longer need! You have had a Hermes app for smartphones since 2010. How important are apps anyways these days? Don't websites adapted for cell phones do the job well enough? Alexander Lange: No, I think both channels are important. Apps on smartphones and tablets provide a much better user experience than mobile websites – you can see this with our new AR parcel category calculator. In contrast though, the platform dependency of apps and the need to constantly develop them does make them fairly expensive. Although cell-phone optimized websites allow us to provide most web applications with a broad user reach relatively economically, the opportunity cost is detrimental to the UX and performance. By rebuilding myhermes.de we are generating improvements to enhance the user experience on the mobile web. We are then enabling the website to be as convenient to use as the Hermes app and we are benefiting from this improved experience. It is going to be interesting to see the impact this will have on the use of the app in the medium term. Thanks for the talk, gentlemen.